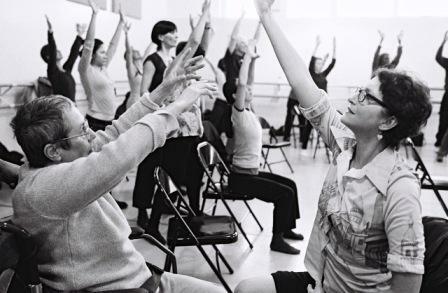 For many of us, our Dance for Parkinson’s classes began as small, intimate sessions for a handful of participants. Although the wide range of Parkinson’s symptoms and manifestations may be present, the tight-knit quality of those pilot classes somehow makes the diversity of abilities seem manageable. More importantly, from a dance perspective, everyone is a beginner in the class. Pleasing everyone: it’s a lot of pressure for us teachers to handle. Here are some suggestions for ways we can keep everyone swimming happily forward at a pace that’s right for them. You probably have some of your own, so please feel free to post via Chatter or by email to share with others. 1. Find and cherish assistants and volunteers who are comfortable translating material for a wide range of abilities. We have individuals in our class who have considerable cognitive and motor challenges and who have a volunteer dance with them, one-on-one for the entire class. While this is not something we can reliably guarantee every week, when it is available, it creates a wonderfully inclusive dynamic in the class. 2. Rethink your own teaching priorities. As our classes progress, we as teachers naturally want to create exercises that are ever more creative, challenging and different than what we’ve done before. This is the natural progression that’s been wired into us as teaching artists. And it’s a good instinct for other populations. But it’s a progression that runs counter to the charting of a neurodegenerative condition. It can also lead to participants becoming discouraged and frustrated–and not coming back. I’m convinced there’s a corollary between the speed and complexity teachers introduce in class and attrition. I’d encourage us to use our creative powers to figure out ways to shed new light on more basic, simpler material. Think about your experience going into a beginning technique class now, as a more advanced dancer. Do you roll your eyes and get bored? Probably not—you might just welcome it as an opportunity to think deeper about what you’re doing, to add breath, to add imagery, and to enjoy a sense of mastery. Simpler material, sparklingly beautiful shorter phrases are much more welcome for a wide range of participants than a complicated, longer phrase. Repetition is another essential element–within each class itself, as well as repeated material that gets reintroduced over the course of weeks or months. Done well, through evolving sophistication, artistry, nuance and understanding, simpler material repeated through imaginative permutations can provide a sense of mastery, and that’s a powerful gift. 3. Layer your exercises. You know the scenario—eight members of your class want to push themselves, the other eight have considerable challenges. By creating two groups, with different material, you can establish a class dynamic in which everyone contributes. Maybe there’s a quicker, multi-part percussive hand dance that has a specific rhythm. You could offer three options: doing the full choreography, doing just one or two moves from the choreography (the stacking part, for example), or clapping out the rhythm. It helps, of course, to have someone else in the room to help lead the different groups. 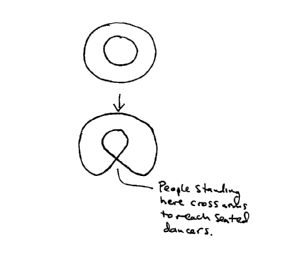 If you’re alone, you may want to start your rhythmic clapping group first, to get them in the flow of things, before bringing in the group doing the full phrase. This concept of counterpoint is a key element in choreographic structure—why not apply it to a class with multiple abilities? 5. Consider adding a special class for young onset, newly diagnosed participants who are still working. We fought this for a long time, because we didn’t want to create levels that would require us to make decisions about who stayed in which class. But we heard so many requests for a class that would be available for those who are still working full time that we made a decision to pilot a ‘Dance for PD Plus’ this fall. A generous individual contribution made it possible to add this class to our budget. Although ostensibly geared toward working people with PD, we also predict that the level of mobility will be higher and that people would like a more rigorous and challenging pace. So the class will take place standing and will focus on mastering a predetermined set of key themes and skills during the 11-week semester. Participants will keep track of their progress through a simple skill checklist and a more extensive self-reflective journaling process that allows them to contemplate and analyze themes we raise in class. The class will meet twice a week and will be limited to 12 participants. I’ll look forward to posting a separate blog about this class later in the fall. More ideas? Please share them!